WOW - such a great number of players and wonderful entries for last weeks PDCC, thanks for much for playing along! 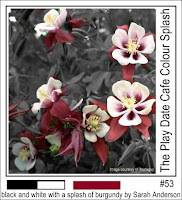 This week Sarah has a wonderful Color Splash of Black, White and Burgundy -- I can't wait to see what you create! The PDCC would also like to welcome Mark's Finest Papers as our weekly sponsor! The PDCC Designers were all given MFP's Flourishes and Frames set to use with this weeks color story. I combined the Circle Flourish and Sentiment from this set with the Hollyhock image from MFP's Pears and Hollyhock set to create my card. Here's this weeks Color Story Photo. We'd love for you to play along with us at the Cafe, you can find all the details here on how to enter. If you upload to any online gallery please use keyword PDCC#53 so we can find your creations! Love that flower! Gorgeous pop of color. 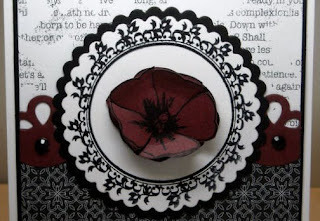 The background papers are beautiful and the punched border works beautifully with the scalloped edges. Gorgeous card. Love the touch of burgundy in border punch and flower! Beautiful layers! Have a great day! 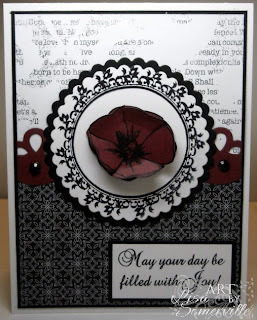 gorgeous card, I thought of those papers immediately when I saw this challenge. Got it on my list of to-dos this weekend. Love the flower on this! Wonderful "splash" Lisa! Love how that beautiful flower is encircled by that elegant frame! So rich and classy! Lovely card Lisa, I love the way you've double layered your flower and your text background works really well with it all. OHHH! That flower is fabbbby! I love that distressed text too! And that border punch...I just love it all:) Great job, Lisa!!! Such a lovely card! That flower is so pretty!